When purchasing an Oriental rug, you have to consider its size, fineness of knots, colours, design, materials, age and condition. A genuine Oriental rug has been hand-knotted in one of the traditional weaving areas of the Middle or the Far East: Turkey, Armenia, Azerbaijan, Iran (Persia), Afghanistan, Pakistan, India, Nepal, Tibet, China. 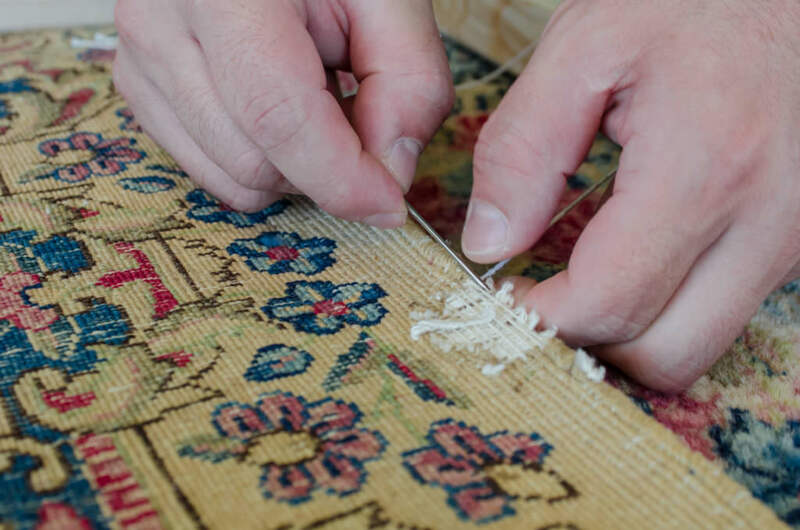 A true Oriental carpet is not machine-made, it is not made of synthetic fabrics, and it does not have a Brand name such as “Nourison”® or “Couristan”®. Hand-tufted rugs are considered hand-made, but they are not hand-knotted! They are made using a gun and glue, and they are definitely not of the same quality. Hand-knotted rugs have imperfections on their face in the colours or design that are sometimes easy to spot (desirable). The back of a machine made a rug is quite different from the back of a hand made rug. 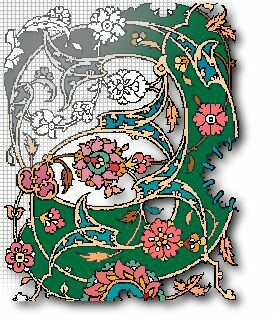 The design is not as colourful and clear on the back as it is on the face of a machine made rug. Since the construction is different, you cannot see individual knots on the back because there are none! 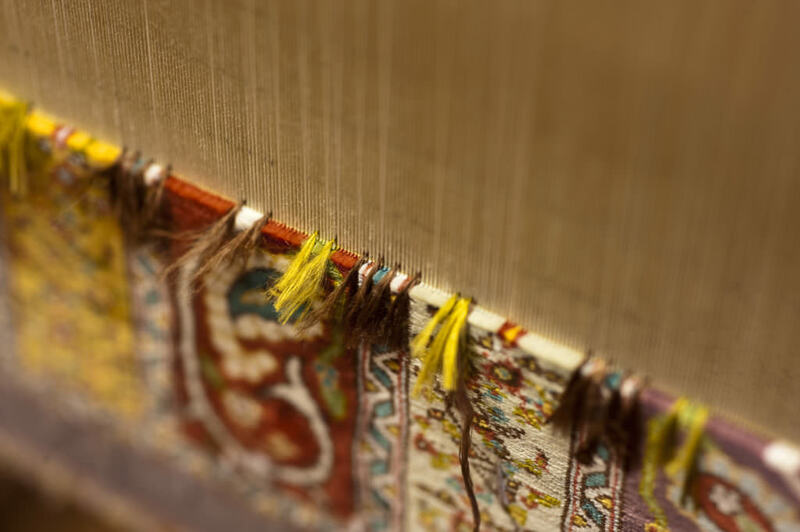 The fringe is also stitched to the end of the machine-made rug after it is complete. The first thing you should decide is where the rug will go in your home. The room you are considering will dictate the size and shape of the carpet. Carefully decide where your rug should be in relation to the furniture and depending on the type of room. A dining room or a hallway should be almost entirely covered. Other rooms such as bedrooms, dining rooms, family rooms, are usually easier to work with. Remember that dealers exclude the fringe when they give the size of a rug. Prices will vary according to labour, materials, quality, place of origin, style, kpsi, and rarity of design. But you can now find rugs to fit any budget. There are much more affordable than they used to be, especially on the Internet where many middlemen are avoided. The warp and weft of an Oriental rug is usually a combination of wool, cotton and (rarely) silk. These materials have much greater durability than synthetics, but they can vary in quality, from fine and soft to coarse. Commonly seen misrepresentations of materials are acrylic sold as wool, rayon or mercerised cotton sold as silk. Some will say that natural dyes are superior to synthetic dyes, but this is not true. Although in recent years vegetable dyes have made a comeback, most rugs nowadays are made using synthetic dyes, and this does not affect their value. Synthetic dyes have been used for carpets for more than a century. They may be slightly harsher in tones, but they are often tougher than natural dyes (less fading). Usually, a higher knot count will mean a higher price, because the carpet took longer to weave and required more material. So the Knots Per Square Inch (KPSI) number is an indication of the value and quality of an Oriental carpet (but not the only one). The type of knot can help identify the origin of a rug. The Turkish knot (also known as a single knot, symmetric knot or Ghiordes knot), which is typically single-wefted, is used in Turkey and many tribal groups in Persia and Central Asia. The Persian knot (also known as the double knot, asymmetric knot or Senneh knot), which is typically double-wefted, is used by some Central Asian groups. Small mistakes and inconsistencies in design or colour will be found and are actually desirable. They are proof that a rug was handmade. You should obtain a Certificate of Authenticity that will validate the size, age, origin, style, condition, materials and knot density, as well as the estimated retail value (for insurance purposes). Make sure you have a good return policy of at least 30 days, with minimal fees besides shipping.